A functional juice extractor that has 800 W of power created as one of the items in the modern series of juice extractors. 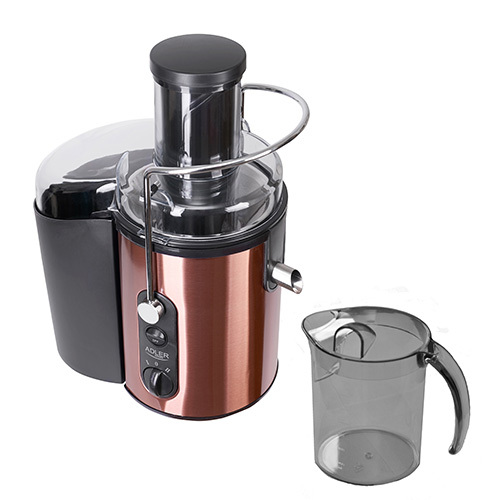 It allows to prepare juice from both fruits and vegetables supporting a healthy diet. The juice is filtered through a sieve with small meshes which keeps the solid parts of the fruit/vegetable away from the juice. The sieve is made of stainless steel. Therefore to the jug goes only juice which contains a huge amount of vitamins. Pulp, stones, seeds and other remains are separated from juice and go to another tank. Due to a safety lock it is impossible to turn the device on when it is assembled in an improper way. 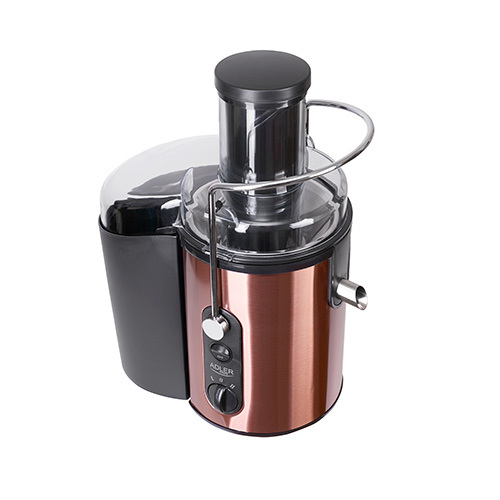 The juice extractor makes it possible to prepare a significant amount of juice in a very short time. It is possible due to a hight power of the engine and a grand capacity of the juice pitcher - 1.5l. It is also very easy and comfortable to keep the device clean - its elements are dishwasher safe. 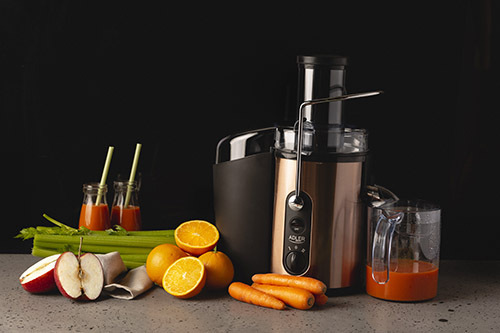 Super fast juice extracting from whole apples, carrots, etc..
Fruit and vegetable juice is one of the healthiest drinks we can prepare for ourselves and our loved ones. This is the simplest way to provide you with vitamins and minerals that we miss especially during autumn and winter. Even our youngest family members will appreciate delicious apple juice! 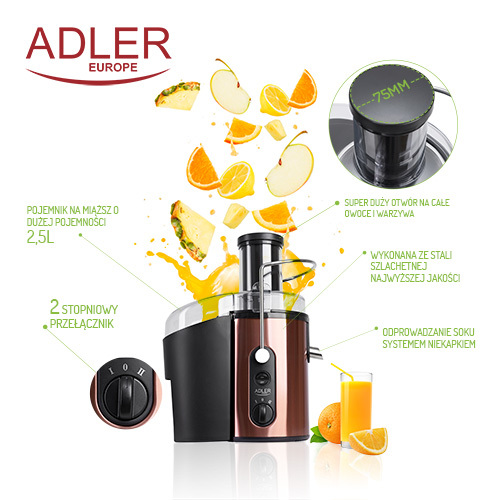 Preparing fresh home juice seems to be quite time-consuming unless you are the owner of the juice extractor ADLER AD 4123. 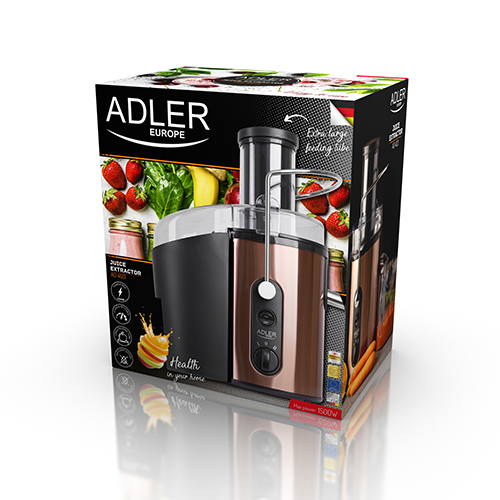 This device will help you prepare a refreshing and tasty drink at any time of the year or day! The most important elements of the device are made of high-quality stainless steel. 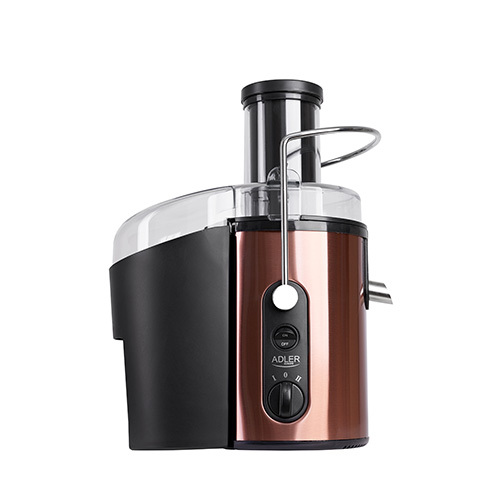 The device is equipped with a small mesh sieve, which allows you to prepare a velvet juice without bits of fruit and vegetables floating in it. The drink is poured with the help of a funnel and a system protecting against dripping so that the kitchen countertops are not dirtied. The device consists of a pulp container, a wide filling hole and a bowl separating the vegetable and fruit pulp from the juice. The pusher attached to the set makes it easy to move small fruits. The lid protects against juice splashing from side to side. 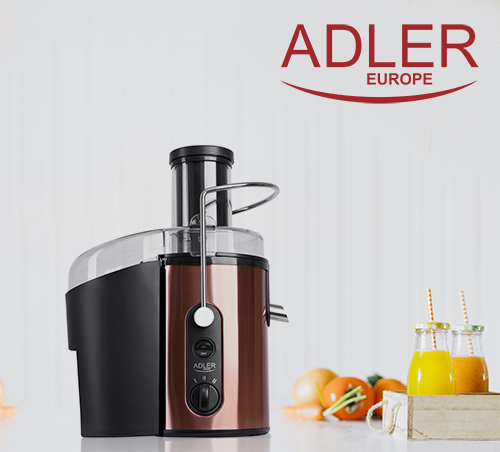 The big advantage of our product is that it has a very large feeder for whole fruits and vegetables, which makes the time of preparing your favourite juice shorter! 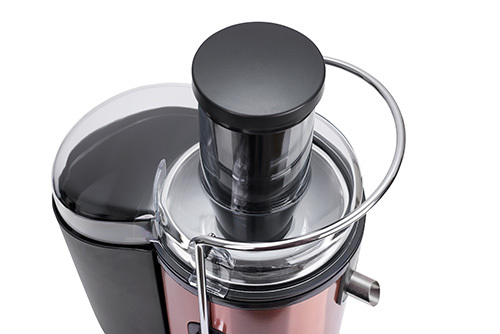 The three-position switch will allow you to quickly turn the juicer on and off. 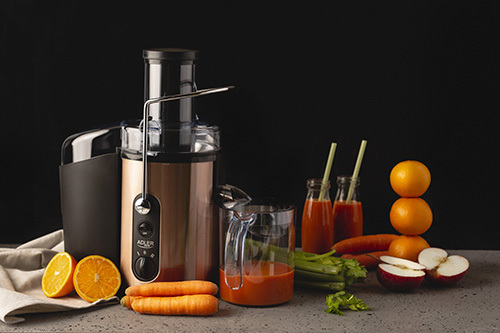 The power of the 800 W allows quick preparation of smooth juice. Just a few seconds and you can easily squeeze juice from whole apples, carrots and other fruits and vegetables. The engine with increased power provides 30% more juice and in result vitamins compared to similar products on the market. The high-capacity pulp container allows you to prepare juice for the family and guests without having to clean the device in the meantime. Safety of product use is guaranteed by an additional safety lock that protects us from turning on the incorrectly assembled device and by stable and non-slip suction cups on the bottom of the device. 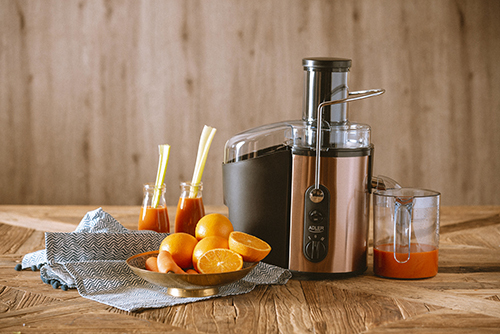 The juice extractor is dishwasher-safe.